This plugin allows the administrator to change the default postbit layout per theme. You can either choose between, the default MyBB behavior and 'horizontal' or 'classic' postbit layout. With the default MyBB behavior the user will still have the option to choose to use the classic postbit or not, while with the 'horizontal' or 'classic' they can not. The setting can be found in the Edit form of each theme. 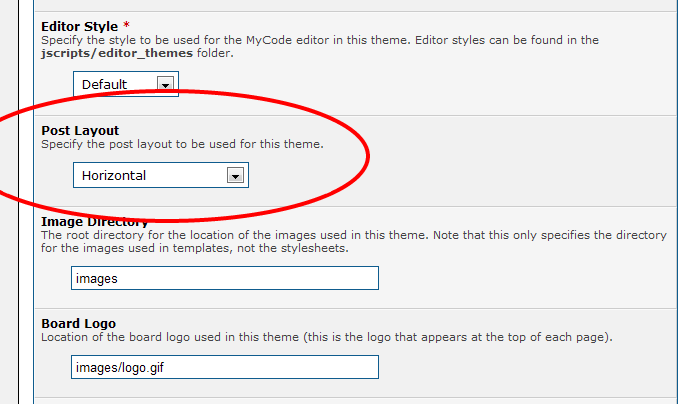 So, Templates & Style > Themes; and click the theme you want to edit. Below the "Editor Style" there is a new setting called "Post Layout". Save your theme if you changed any of the settings. Please only report bugs or any other problem in the plugin thread or the Plugin Support subforum on the MyBB Community Forum. I can not respond to comments/reviews on mod site. - give this plugin a good review on the mod site. - rate this plugin on the mod site. Allows you to change the default postbit layout per theme and force users to use it. Forces all your users to use the default postbit style.